1 mg (2 x 500 μg) lyophilized 3’3’-cGAMP Vaccine grade adjuvant. 3’3’-cGAMP is shipped at room temperature and should be stored at -20°C. Lyophilized product is stable 1 year when properly stored. Upon resuspension, prepare aliquots of 3’3’-cGAMP and store at -20°C. Resuspended product is stable 6 months when properly stored. Avoid repeated freeze-thaw cycles. 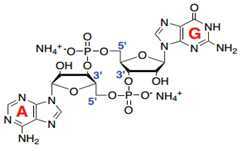 3’3’-cGAMP (cyclic [G(3’,5’)pA(3’,5’)p]) is a cyclic dinucleotide produced by bacteria. Cyclic dinucleotides (CDNs) are ubiquitous small molecule second messengers synthesized by bacteria that regulate diverse processes and are a relatively new class of adjuvants that have been shown to increase vaccine potency. CDNs activate innate immunity by directly binding the endoplasmic reticulum-resident receptor STING (stimulator of interferon genes), activating a signaling pathway that induces the expression of interferon-β (IFN-β) and also nuclear factor-κB (NF-κB) dependent inflammatory cytokines. Recently, 3’3’-cGAMP was reported to bind STING and subsequently induce TBK1-IRF3 (TANK-binding kinase 1-IFN regulatory transcription factor3)-dependent production of IFN-β. 3’3’-cGAMP is also referred to as “canonical” cGAMP due the presence of the classical 3’-5’ phosphodiester linkages between the guanosine and the adenosine. Structural and functional studies revealed that the canonical 3’3’-cGAMP produced by bacteria is distinct from the noncanonical 2’3’-cGAMP produced by mammalian cGAS. Certain variants of STING are able to distinguish between canonical and noncanonical cGAMP. 3’3’-cGAMP is more potent in activating IRF3 than c-di-IMP, c-di-AMP and c-diGMP, other cyclic dinucleotides that also bind to STING. Add 500 μl sterile endotoxin-free physiological water (provided) to 500 μg 3’3’-cGAMP.